little bee books, 9781499804218, 40pp. This hilarious follow-up book to Cockatoo, Too features cockatoos, toucans, two-can stew, and gnus! One can. Two cans. Toucans? The cockatoos are back, and the toucans are too! But the toucans think the cockatoos say "toucan stew" and run away in a toucan canoe, so the cockatoos make them some two-can stew, which attracts the gnus, who ask the reader, "Can gnu?" 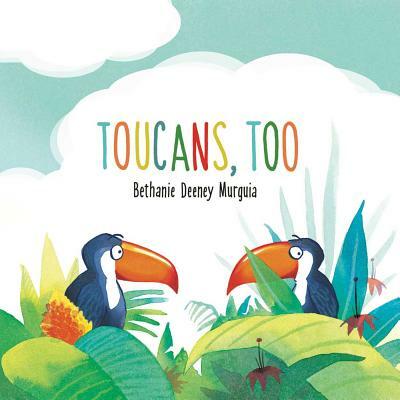 Bethanie Deeney Murguia's fabulous follow-up to the well-received Cockatoo, Too combines fantastically funny wordplay with lush, vibrant illustrations, making this a humorous read-aloud that both children and parents will love! Bethanie Deeney Murguia graduated from the School of Visual Arts in New York City with an MFA in Illustration and has created numerous picture books, including Cockatoo, Too, Zoe Gets Ready, Snippet the Early Riser, and I Feel Five. She now lives in the San Francisco Bay area with her two daughters and her dog Disco. To learn more about Bethanie, please visit her website: aquapup.com.